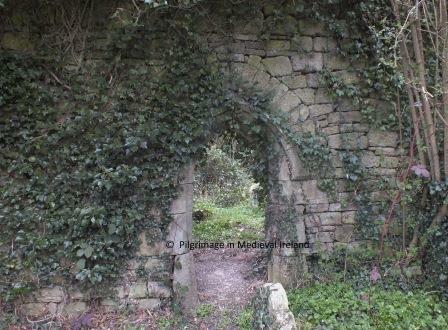 Kilronan medieval church & holy well at Glebe, Co Waterford. 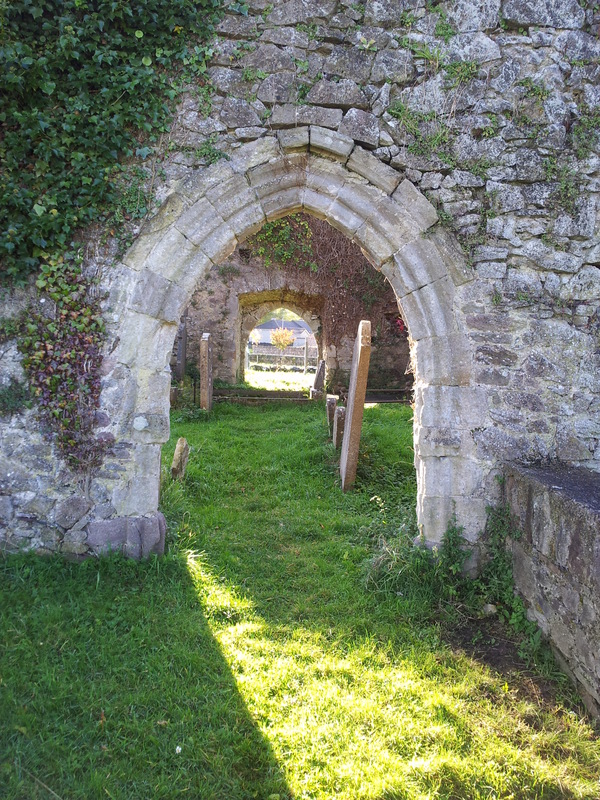 A few days ago, I visited one of County Waterford’s hidden treasures, the medieval parish church of Kilronan. I am in the process of doing some historical research into this site but here are some of my initial observations. Kilronan medieval parish church at Glebe, Co. Waterford. Kilronan church is located in the townland of Glebe, in the barony of Glenihery, close to the Tipperary Waterford country boundary. 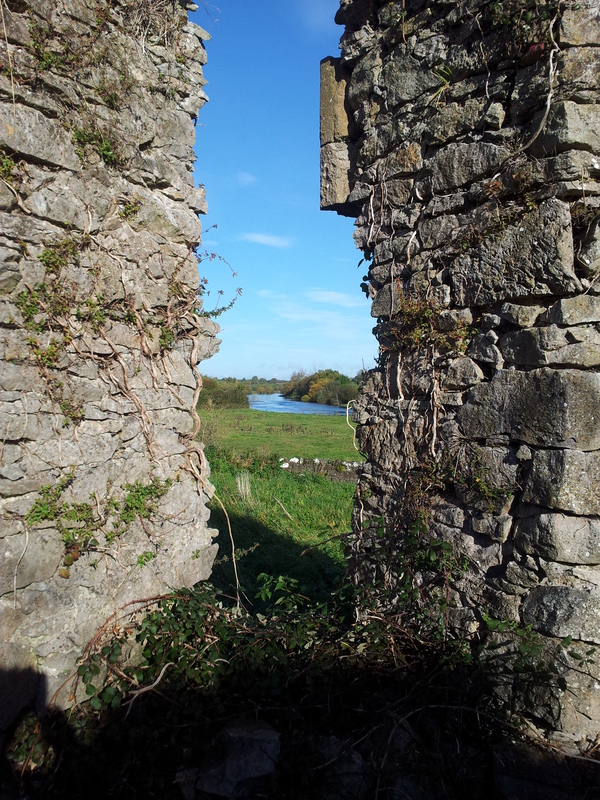 It is a short drive from the town of Clonmel (c. 6km), just off the Dungarvan-Clonmel near the crossroads at Kilmanahan. 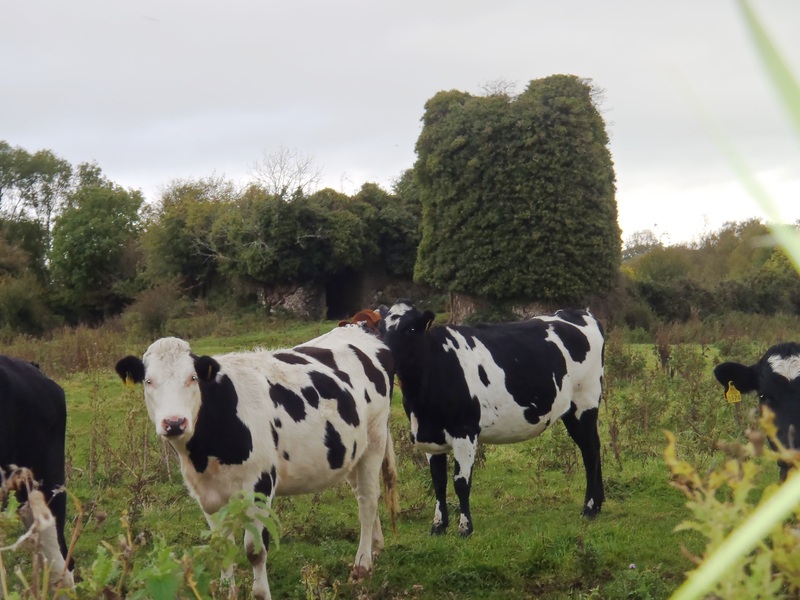 This area is in the diocese of Waterford and Lismore, which came in to existence in the later medieval period following the amalgamation of the dioceses of Waterford, Lismore and Ardmore . Map showing Kilronan church and holy well taken from Bing maps. The name Kilronan or Cill Rónáin means the Church of Ronan which suggests there was an early medieval church of some sort in the area. There are several saints called Ronan listed in the early medieval calendars of Irish saints, however there is no way of knowing which of them was connected to this area. There is no trace of an early medieval church at the site or anywhere else in the parish. The diocesan system in Ireland came into being in the 12th century and the present church was built after the 12th century, it may be possible it was built on an earlier church. The townland name Glebe, refer’s to church land. Glebe land was used to support the parish priest. According the Ordnance Survey Letters of the 1840’s the church was remodeled in the 15th century, when it and the parish were re-dedicated to St Laurence. 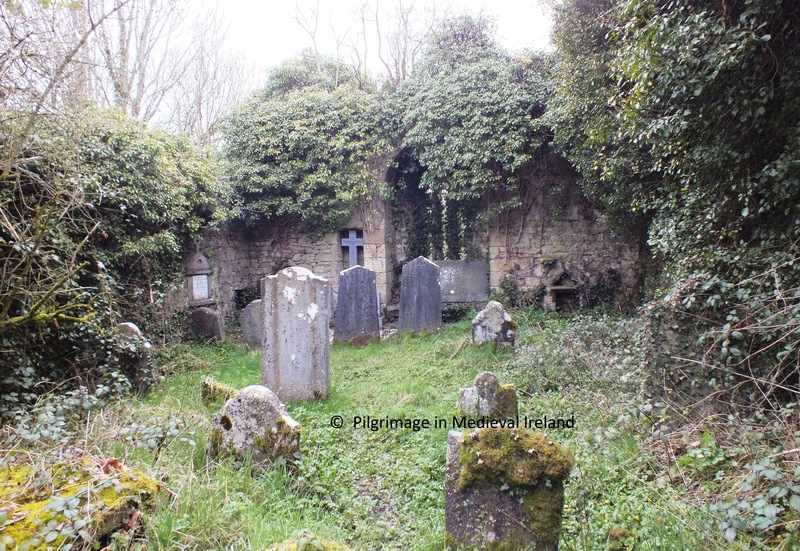 Kilronan church sits in a rectangular graveyard with gravestones range from late 1700’s to modern times. 19th century farm buildings are built against the church on the north and west side. 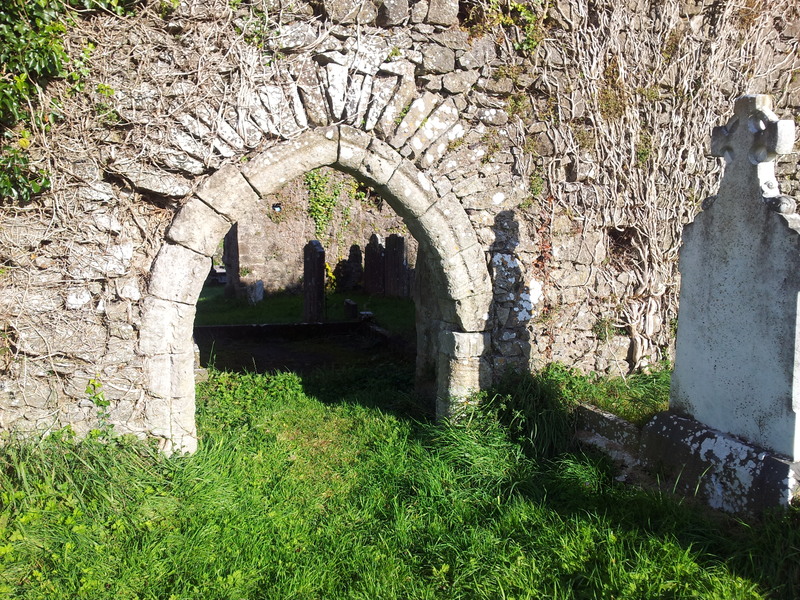 It is surprising that there has been little academic discussion of Kilronan as it has some very unusual and interesting architectural features. As you can see from the photo above a layer of very thick ivy covers much of the walls of the church. It is difficult to accurately date the church as it is so over grown but it is mentioned in a document written by Pope Nicholas’s in 1291, which suggests it was constructed prior to the late 13th century. The original building was altered in the 15th century and a number of new windows and a door were added. The church is built of sandstone and is entered through a door at the west end of the south wall. The door way is a lovely 15th century hooded moulded doorway. If you look closely at the photo you can see the door way was inserted into an earlier larger doorway. It is difficult to see all the windows with the ivy. Rev. 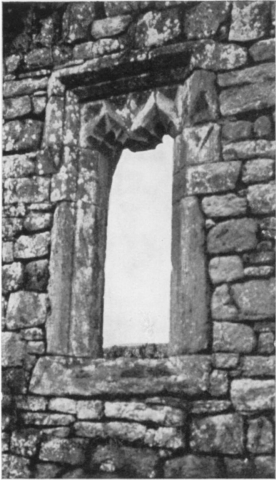 P. Power, the former head of Archaeology at UCC, writing in 1938 counted 6 windows and suggest there was at least one more. I noticed two window (one blocked) on the west side of the doorway, and a twin-light, cusped ogee-headed window at the east end of the south wall. There is a blocked windows in the north wall. All the windows have very wide embrasures. The largest and most elaborate window is found in east wall of the church. It is a three lights window with switch line tracery. 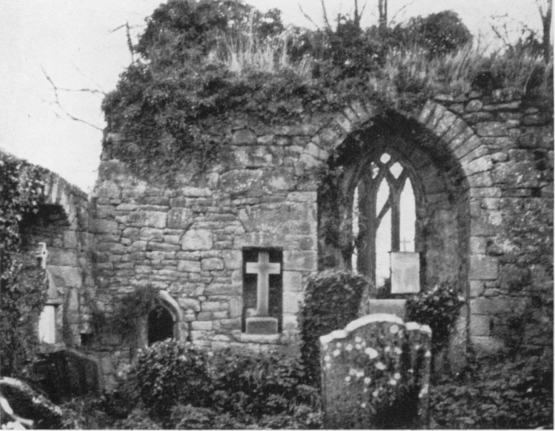 Today it is covered in ivy so below is a photo of the east wall and window taken in 1938. Image of east wall of church taken in 1938 (Power 1938, 63). The church has a simple rectangular plan, the interior it is now filled with 18th and 19th century burials and heavy vegetation growth. There is no evidence of any internal division between the chancel and nave. The Archaeological Inventory of Co. Waterford noted there was ‘ traces of rood-screen sockets towards the E end of the long walls’ . In the south-east corner of the church, the ivy free sections of the wall shows the upper courses leaning inwards which may suggest evidence of vaulting. Power noted that notable individual details is the evidence of a former double roof; this is voussoirs of the inner vault plainly visible on the south side (interior) of the building. 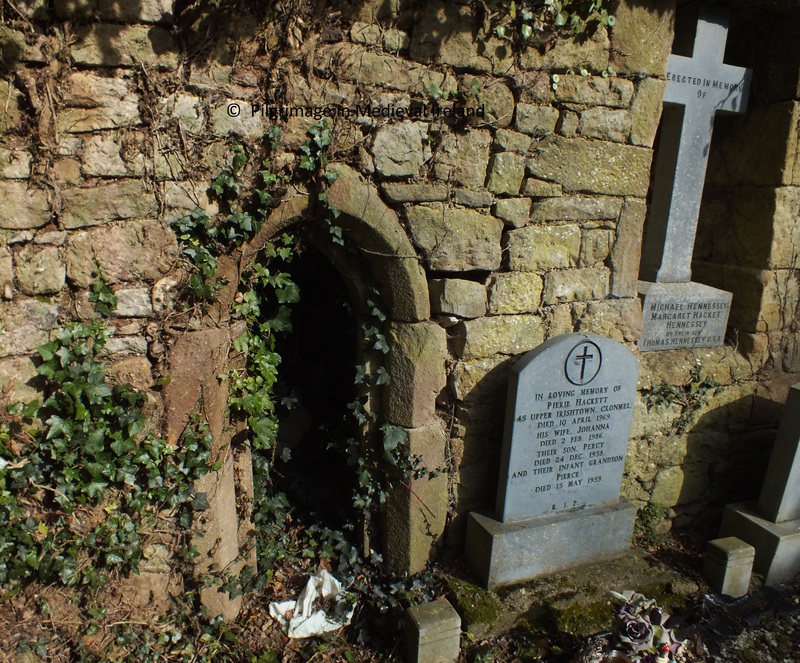 No doubt there was, as in Cormac’s Chapel, a chamber for lodging of the priest, above the barrel vault, and in this connection, note the putlog beside the entrance door, clearly the door way was fastened from within, i.e., the ecclesiastic lived in the church. If Power is correct then the priest live within the church above a vaulted ceiling. In medieval times the priest often lived at or in the church, in accommodation above the west and sometime the east end of the church, in an upper story apartment or in accommodation attached to one side of the gable end of the church, or in residential towers attached to the church (Birmingham 2006, 169). Less commonly the priest could live in a free-standing house were also used (ibid.). 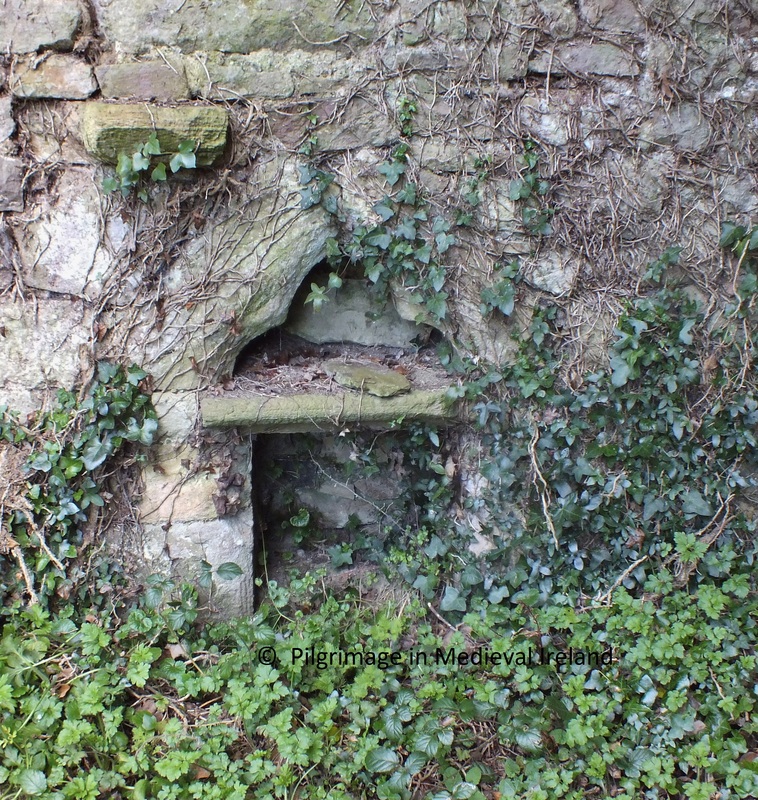 The use of vaulting is not unheard of in creating an upper floor for the priest residence and examples of vaulted medieval parish churches are found at Kilbride Co. Offaly, Gallon and Raffony, Co Cavan & Leighmore Co Tipperary (ibid., 173-174). The east wall of the church is the least affected by ivy which is fortuitous as some of the churches most interesting features are located within this wall. At the south end is a piscina, a recess with a shallow basin used to wash the communion vessels. The upper section of the Kilronan piscina has an elaborate trefoil-head, a shelf and the basin has an incised petal design. At the north side of the main east window a modern memorial cross has been inserted into one of several aumbry that are found within the church. An aumbry is a fancy word for a cupboard. There is a small pointed finely cut sandstone door way which leads into a tiny room (dims. 2.03m x 0.85m) that is built into the east wall. The room is tiny, a stone seat is built against the north wall and aumbry (cupboard) is found in the eastern corner of the south wall. The room is roofed with flat lintels and small square window is found in the center of the east wall. This is a very unusual feature which I have not found at any other church perhaps the closest parallel I can find is Okyle church and anchorite cell. I am very curious as to what the function of this room. It is a tiny room so would an anchorite be able to stay here ? Does it have a penitential purpose? I plan to look into this further and I will keep you posted on my findings. Close to the church c. 60-70 m away is lovely looking holy well. The well is a semi circular superstructure with a large brick cross on top. The Ordnance Survey Letters of 1840 do not record any saint associated with the well nor does Power writing in the early 20th century. It is always simply referred to as the ‘Holy Well’. According to Power the holy well was venerated up to the 1930’s but he gives no further information. The stagnant water within the well suggests is no longer visited. 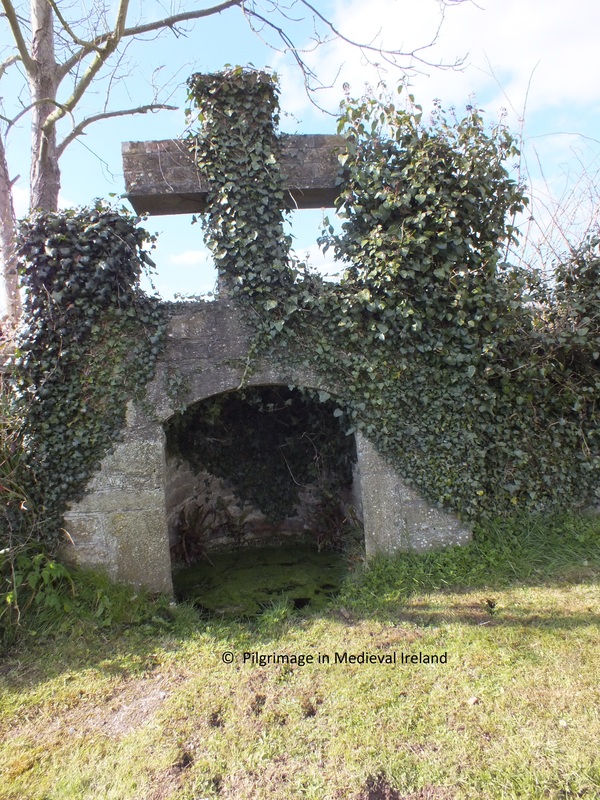 I would love to hear from anyone who knows any history of the well or its traditions and I will come back to Kilronan again and share any new findings on its history and architecture. Birmingham. 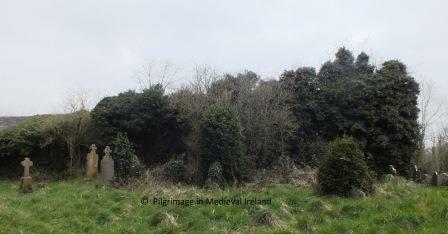 H. 2006, ‘Priests’ residences in later medieval Ireland’, in Fitzpatrick, E. & Gillespie, R. (ed.) The Parish in Medieval and Early Modern Ireland.Dublin: Four Courts Press, 168-185. Ordnance Survey in 1841. Bray: Typescript. dioceses. Cork: Cork University Press. Power, P. 1938. ‘Some Old Churches of Decies’, JRSAI, Vol. 8, 55-68. 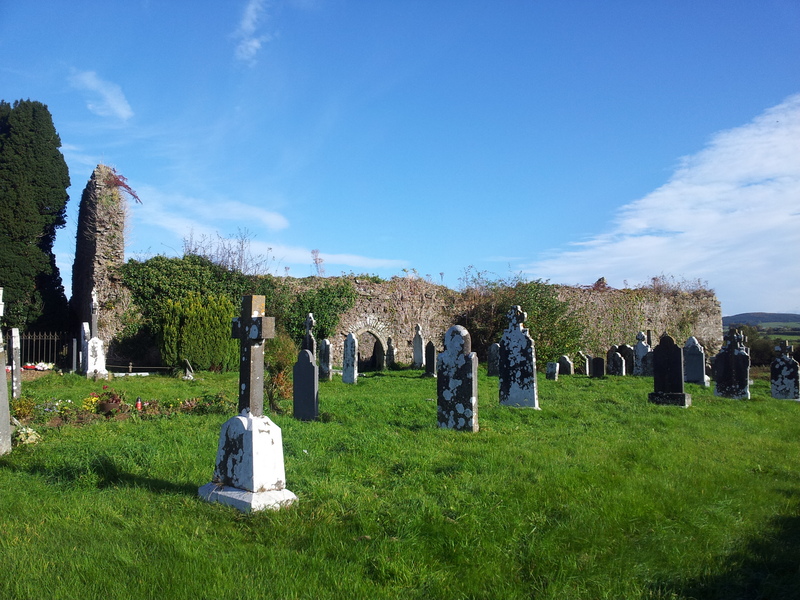 This week I headed along to another historic graveyard at Middlequarter, Newcastle, Co. Tipperary. 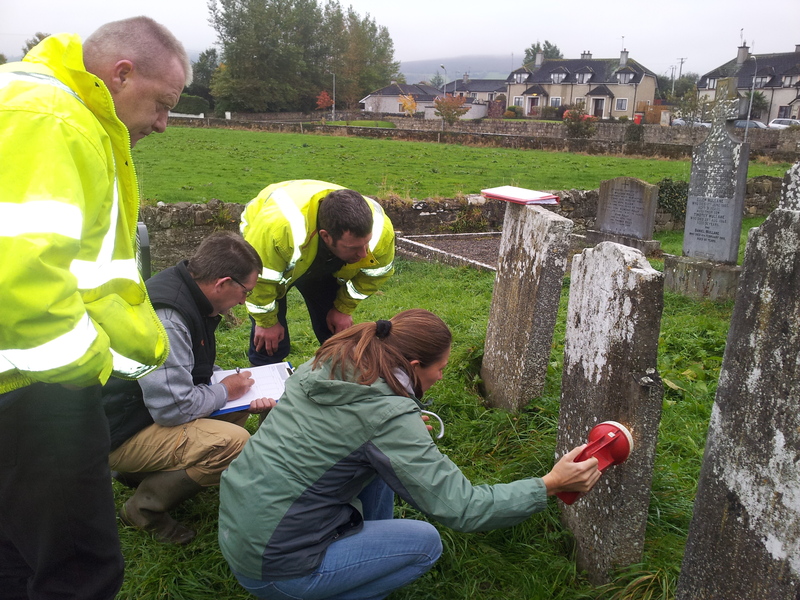 The old graveyard at Newcastle along with the graveyards at Molough, Shanrahan and Tubrid, are currently being recorded by local community groups trained by Historic Graves (http://historicgraves.ie/). Newcastle graveyard is located close to the Anglo-Norman castle which gives its name to the area. The remains of the castle consist of a hall house with a vaulted roof, a tower and a bawn. 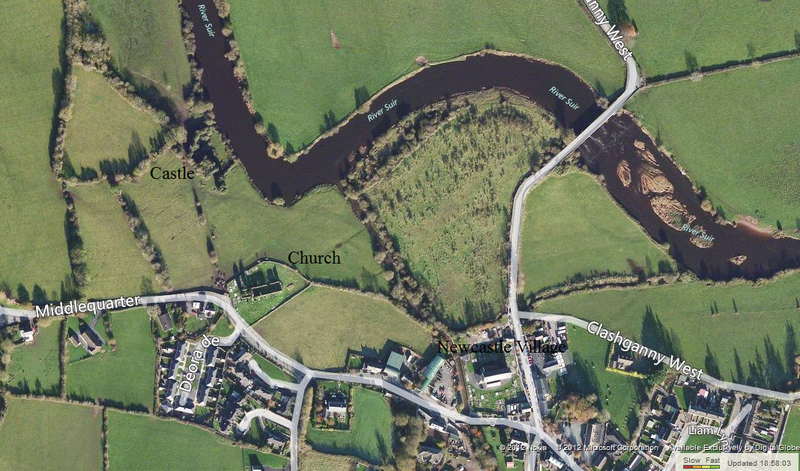 The castle is strategically located on the banks of the River Suir close to the fording point . The castle is part of a group of 12th -13th castles built in a line along foothills of the Knockmealdown mountains. This area was the frontier between the Anglo-Norman territory and the Gaelic territory of the Déises . Newcastle was in the control of the Prendergast family from the 13th to the 17th century, it then passed into the hands of the Perry’s family. 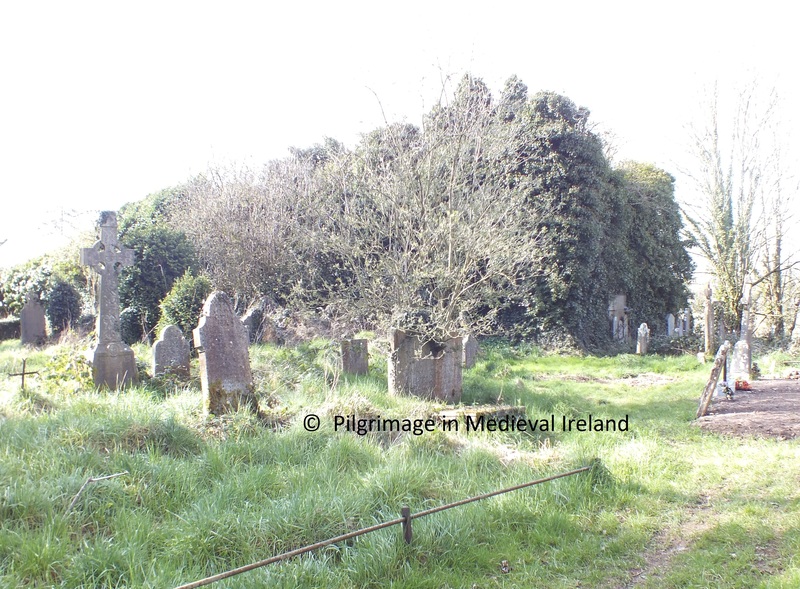 The historic graveyard surrounds a 12th /13th century church, which functioned as the medieval parish/manorial church . Newcastle church is one of the largest medieval parish churches in the surrounding area, being 29m in length and 10m in width. Any past dedication to a saint has long been forgotten and today the church is simply known as the old church. The church is entered through two ornate doorways at the west end of the church, located in the north and south wall. The south doorway is simpler in design with a moulded surround. The north doorway is slightly taller and has roll and fillet-mouldings with traces of hood- moulding over the apex of the door. Both doors are directly opposite each other. There is no evidence of an internal division between the chancel and the nave within the church, nor is there any traces of a choir. The Ordnance Survey letters also state that ‘ the church was burnt by a Prendergast who lived in Curraghcloney Castle’ (O’Flanagan 1930, vol. 1, 23). However today many local people tell the tale, that it was Cromwell who burned the church . The graveyard has a mixture of 18th , 19th and 20th century graves, including some very recent ones. In total there are 204 grave markers in the graveyard. It is difficult to decide which gravestones to include here as there are so many interesting ones. The stone below was carved in 1755 to commemorate the death of Denis Morison. 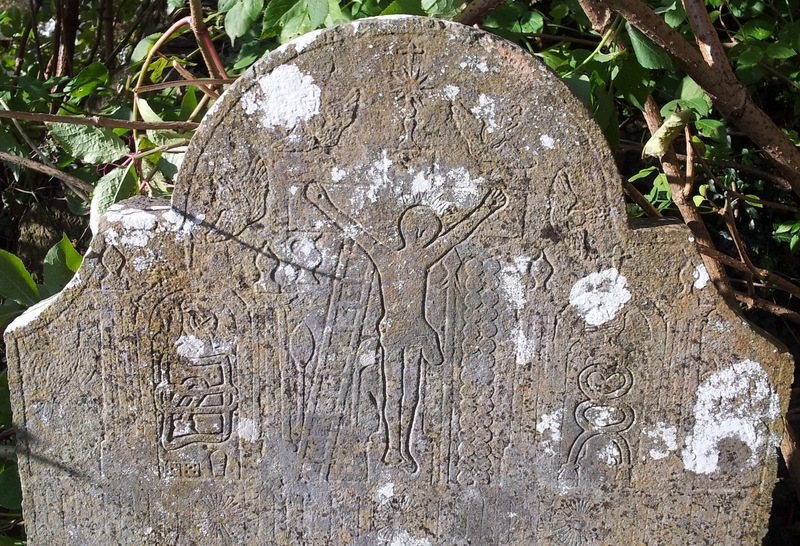 Some of the early gravestones have lovely decoration. The stone below depicts the crucifixion scene and a stone by the same mason has been identified in Shanrahan & Tullaghmelan graveyards. 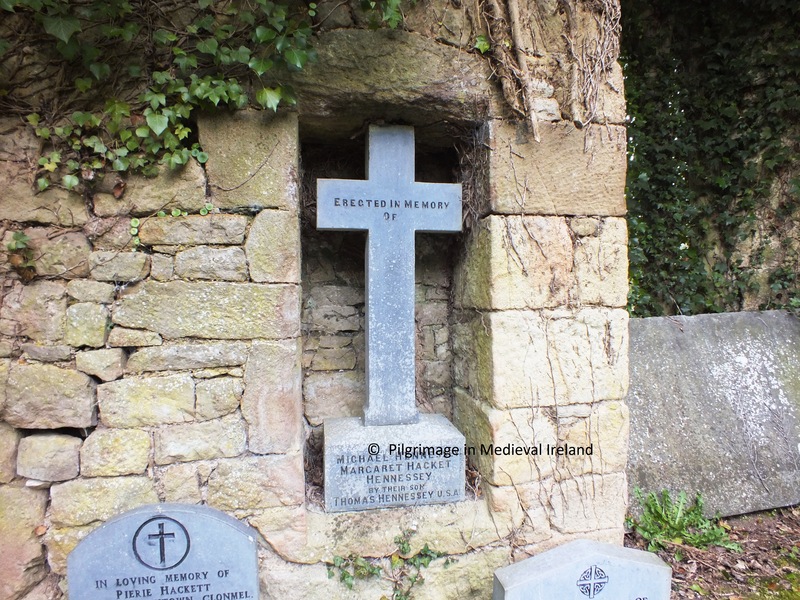 Here lyeth the body of Jeffry Prendergast of Mullough in the county of Tipperary who served in Flanders as Captain under the Great Duke of Marlbourugh, from whom he had the honour of reciting public thanks for his services at the siege of Ayr in 1710. Died 1713. he was an affectionate husband and tender father, in friendship steady and sincere; to all beneath him courteous, truly just and therefore universally esteemed and beloved. He lived under the influence of religion and died cheerfully supported by it the 27th day of March in the 64th year of his life. John Burke’s A Genealogical and Heraldic History of Extinct and Dormant Baronetcies….. records that Jeffrey’s father Thomas Prendergast, esq was born in 1614 and married Elinor the sister of Walter the 11th Earl of Ormond. 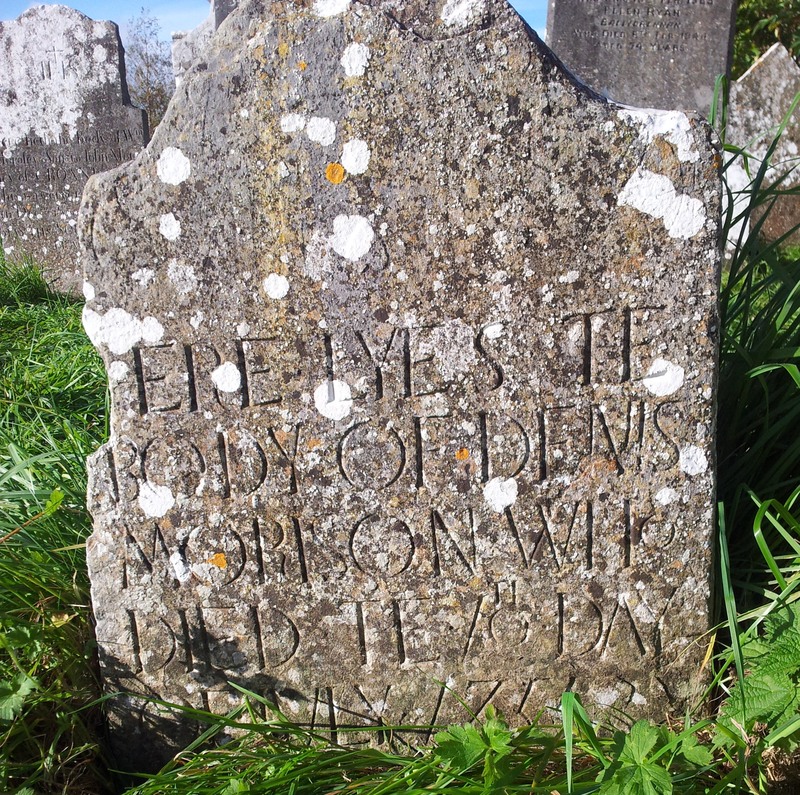 The text also says Thomas died in 1725, aged 111 years ‘as appears on his tombstone at Newcastle, near Clonmel’. 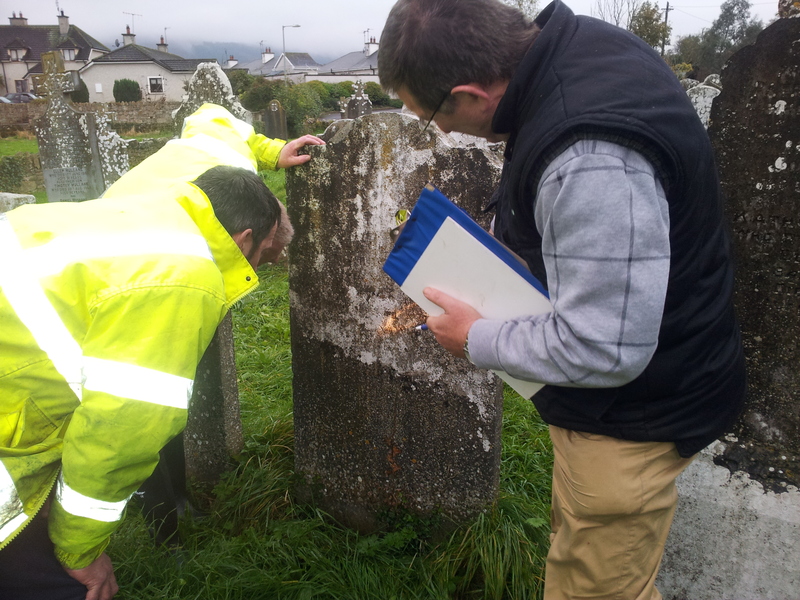 Once the survey is complete if the tombstone commemorating Thomas survives I am sure the volunteers will uncover it. I would wonder if he was not interred with his son Jeffery. 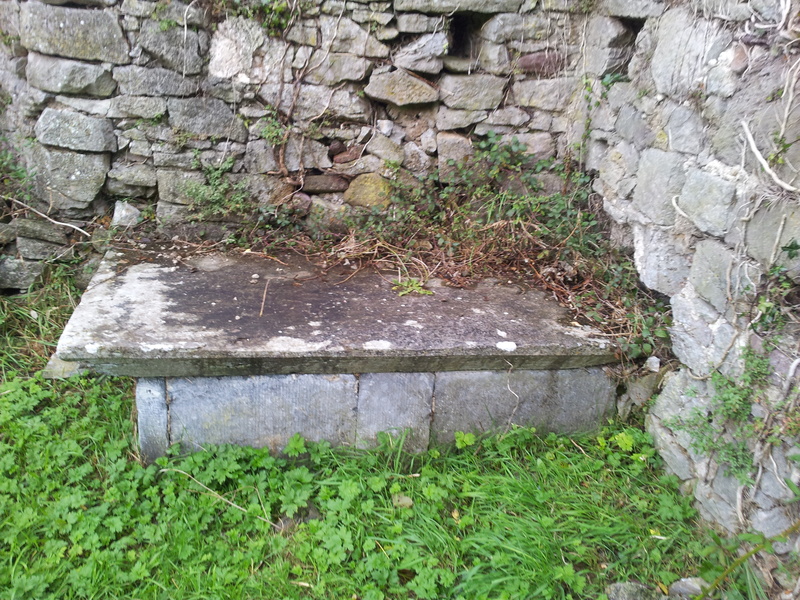 Beside the Prendergast tomb are two grave slabs which I recorded as part of a project for college in 1998. The inscription on slabs have deteriorated since I last visited here. One has a motif of a horse standing on its hind legs in an oval frame. This is the grave of Samuel Hobson sq of Muckridge, who died in 1782. 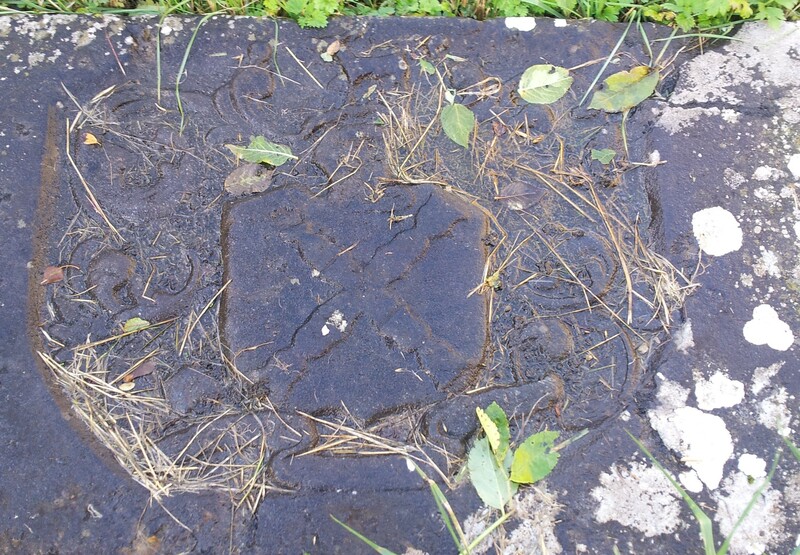 The second slab records the burial of ‘Lieu Henry Prendergast of Mulough’ and his wife who died in 1776 , along with their a coat of arms. Hallinan, M, 1996. Tales from the Deise: an anthology on the history and heritage of Newcastle, the Nire Valley, and especially the Parish of Newcastle and Four-Mile-Water. Dublin: Kincora Press. O’ Flanagan, Rev. M. (compiler) 1930. Letters containing information relative to the antiquities of the county of Tipperary collected during the progress of the Ordnance Survey in 1840. 3 Vols. Bray: Typescript.